(Nanowerk News) European researchers have created a CMOS (semiconductor) camera capable of filming individual photons one million times a second. The breakthrough will impact on all the most advanced areas of science and makes Europe the world leader in the technology. 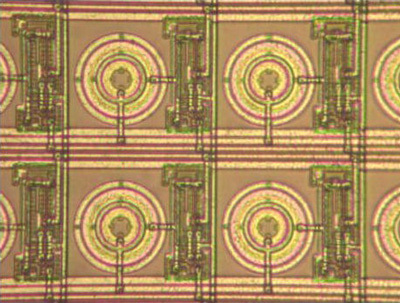 The scientists wanted to create the fastest, highest resolution CMOS (semiconductor) video camera, but to do that they needed to choose an ultra-fast photo detector. They also needed to choose between two competing timing mechanisms or stopwatches, Time to Analogue Convertors (TAC) and Time to Digital Convertors (TDC). The timing mechanism is important. It can tell, to within a few tens of picoseconds, when the photon arrives at the detector. It creates stunning resolution in time. Detail of the CMOS 32 x 32 Single Photon Avalanche Detector Array. As they studied TAC and TDC, the researchers realised that both methods had peculiarities that provided advantages in different applications. Instead of eliminating one technology, they characterised two. It was a Eureka moment for the Megaframe project behind the research. “We got really excited, and we are going to explore this further in the second phase of our project,” explains Edoardo Charbon, formerly with EPFL and now at TU Delft, coordinator of Megaframe. It is an indication of the drive and enthusiasm of the team. The dust has hardly settled on the worldwide breakthroughs achieved by the first phase of the project, and already Megaframe is looking forward to the next breakthrough. Imaging technology has advanced rapidly over the last few years. But the demands of science have advanced even more rapidly. New scientific fields like proteomics – studying the different proteins that form the human body – pose a problem because they require cameras that are capable of recording data at photon-resolution, and extremely fast. That problem is now essentially solved thanks to the work of the Megaframe project, which developed a CMOS video camera that can capture 1024 individual photons at one million frames a second. It can record, to within 100 picoseconds, when the photon arrived at each detector. It is insanely fast. There were enormous challenges on the way to achieving their goal. The first challenge was to miniaturise the photo detector they had selected, the Single-Photon Avalanche Diode (SPAD). The stopwatches are essential to record when the photon arrives, SPADs are necessary to detect the light, and both need to be present in each pixel. And the consortium wanted to do a 32 by 32 array of pixels, making a total of 1024 individual SPADs and stopwatches! Then they had to decide which stopwatch they needed to use, the TDCs or TACs mentioned earlier, which led to one of the most exciting of the project’s many breakthroughs. Megaframe phase I simply sought to establish that a photon-resolution, high-speed CMOS camera was possible at all. Both the TDCs and the TACs met the design targets, but instead of eliminating one, they discovered that they could potentially use the two in different ways. It was a research breakthrough because the team expanded the potential usefulness of the underlying technology. “In the second phase of the project, we decided to focus on TDCs, because they were easier to implement,” stresses Charbon. But the work on both stopwatches is useful for further study in later phases. The upshot is that their camera can time the arrival of a photon to within 100 picoseconds, and they can do it up to 1 million times a second. “And every microsecond we can count up to 64 photons,” declares Charbon. "That was a big, big challenge. In integrated circuit design, achieving a certain performance is usually possible, but achieving that performance in a large number of miniaturised components, working simultaneously, with a supply current optimised in a way that it does not disturb the other components, that is very hard. Of course, all these electronics in 32 by 32 array produce a staggering amount of data, so the partners needed to develop new and improved ways of moving the data from the pixels into storage. In the end, they developed a high-speed, highly parallel readout capable of achieving 10Gb/s. “There were two more very important challenges. One was the optical challenge. If you have a pixel that is 50 microns-by-50 microns, with a lot of functionality in it, the area that is sensitive to photons can only be a small proportion of this pixel. So you can imagine that only maybe 1% of the pixel can be used to detect light,” Charbon explains. The consortium included a partner specialising in microlenses, which are able to concentrate the light to the sensitive element. It was a complex task, but the high-precision lenses work amazingly well to lead the photons onto the photosensitive areas that are just 10 microns in size. Another challenge was to make the camera compatible with existing microscopes, essential if the technology is to gain acceptance in, for instance, advanced biomedical research labs. The technology passed validation and the Megaframe camera is, in itself, an enormous breakthrough in imaging science and worthy of a celebration on its own. It has validated European expertise, established the Continent’s leadership in the domain, and proven an excellent training ground for future engineers and scientists. What’s more, it will have enormous ancillary benefits for allied fields like lithography, integrated circuit design and a host of others. But by far the most exciting result from Megaframe’s work will be the science that it will enable in dozens of unrelated fields, everything from molecular biology and medicine, to automotive and aeronautic testing and development, entertainment and 3D television, and many others. The legacy of the Megaframe project will not be that it established European leadership, but that it will foster innovation in so many other areas. The Megaframe project received funding from the FET-Open scheme for future and emerging technologies in the EU’s Sixth Framework Programme for research.